The USS Zumwalt (DDG-1000) guided missile destroyer may be touted as one of the most lethal and cutting-edge weapons in the Pentagon's arsenal, but mounting costs have left the warship's biggest gun systems without bullets to shoot, RIA Novosti reporter Mikhail Sheinkman asserted. "USS Zumwalt is second to none with regard to size and displacement," he said. "But as it turns out the warship is only lethal on the surface. When it comes to its combat duties, no one knows whether it will be able to fire. In any case those who designed this sea 'whangdoodle' have clearly missed the target." 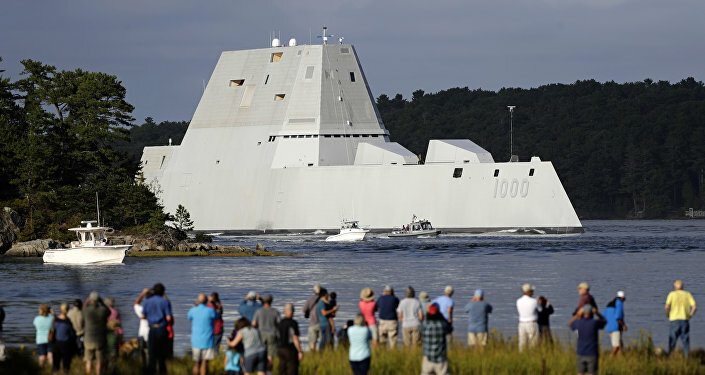 Sheinkman's comments come following reports that the US Navy decided to refrain from purchasing ammunition which was specifically designed for USS Zumwalt's 155-millimeter Advanced Gun System since the rounds have turned out to be too expensive. A single round of the Long Range Land Attack Projectile (LRLAP), designed for Zumwalt's Advanced Gun System, is said to cost at least 800,000. In other words, "the 155-millimeter gun system will most likely be kept just for show and grandeur," Sheinkman noted. "In any case, the ship will not be able to put fear in the hearts of its enemies since it is sort of invisible." The warship itself has cost a whopping $7.5 billion, with total program costs exceeding $22.5 billion. For comparison: the Pentagon's most expansive weapons program, the Joint Strike Fighter (JSF), is estimated to cost $1.5 trillion through 2070. However, a single Lockheed Martin F-35 Lightning II stealth multirole fighter, produced under the JSF, costs approximately up to $116 million and the defense contractor has already built more than 170 F-35s out of some 3,500 planes expected to be produced in the coming decades. For its part, the Zumwalt-class of destroyers will comprise three ships instead of the initially planned 32. Skyrocketing costs are one of the reasons behind these cuts. Incidentally, the cuts themselves were precisely what has caused the LRLAP to cost so much. In 2001, Lockheed Martin, the contractor responsible for developing the rounds for Zumwalt's cutting-edge gun system, estimated that LRLAP's cost would not exceed $50,000.